There are a few things I'm known for. These cookies are one of them. 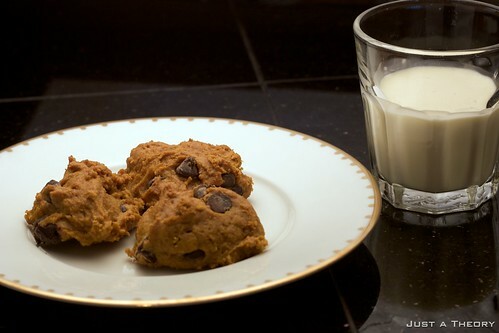 Because they're made with pumpkin, they are softer, cakey cookies. If you like them crunchy, as I do, stick them in the freezer. Perfection. Mix first 5 ingredients together. Mix dry ingredients minus chips and then gradually add to wet. Stir in chips. Bake at 350 (F) for 15-25 minutes. Note that they don't spread much, so keep them on the small-t-medium side or they'll take forever to cook through. i just made these yesterday. they are incredibly yummy and super quick and easy to make. thanks julie! !